This post was recently published at Smartblog on Leadership. When someone got promoted to team leader, supervisor, or manager, they were sent a memo (no email yet) from HR informing them that they have been registered for a mandatory 4 week supervisory training course. When they showed up, some (or most) of them kicking and screaming, HR told them everything they had to learn, showed them step-by-step details, made them practice (role plays), and then sent them off to do good and no harm never to be seen or heard from again. Sadly, there are many organizations that are still using this outdated method of leadership development. While this model is inherently flawed in a number of ways, the biggest problem with it is that people won’t grow or change unless they want to. They need to be intrinsically motivated to change, and in order to be motivated, they need to have a sense of autonomy, or control. While force-feeding leadership development was never a good idea, neither is going too far in the other extreme. Some organizations have adopted a philosophy that says “you’re in charge of your own development”. Which sounds great, but it often ends up really meaning “good luck, you’re on your own, now sink or swim”. 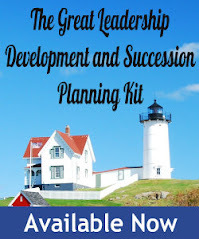 They eliminate all training programs, budgets, and support, and mandate “individual development plans”, without teaching people how to develop on their own. 1. Find out for yourself what really matters. Don’t just rely on the HR-produced formal leadership competency model. Most of these are so complicated or sanitized they aren’t very helpful at all when it comes to figuring out how to succeed as a leader in your organization. Instead, ask around and find out who the most respected leaders are, then go and talk to them about what skills and mindsets are the most important and why. 2. Go get feedback. Don’t wait for a formal 360 assessment, or for someone to tell you where you’re screwed up when it’s too late to do something about it. There are a number of free 360 assessment tools out there- just do a search. Here’s 10 more ways to get candid feedback, including one of my favorites, “feedforward”. Everyone is different, and will have different learning needs. Find out what yours are instead of conforming to what everyone else is told to learn. 3. Write your own development plan. Don’t wait for your boss to write it, or for HR to tell you to write one. If it’s your development, then it’s your plan. If you don’t have a template or know how to write one, here’s a few samples. 4. Find your own training – then ask for it. Don’t wait to be sent to class, or wait for your boss to make the offer. After you’ve completed steps 1-3, find a training program that addresses your specific development needs. If you pick it, you’ll own it, and be much more motivated to learn and change. Sure, budgets might be tight, but if you put a good business case together, you just might be surprised. Maybe you offer to meet your company halfway – you attend on your own time of they pay for it, or you offer to pay half yourself. 5. Ask for an executive coach. Executive coaches are usually provided to select executives on their way up, or executives in trouble on their way out. However, I’ve heard of plenty of organizations that will approve coaching to an executive who steps forward and asks on their own. Again, you never know. When it comes to your own development, you have to be the squeaky wheel! 6. Negotiate your work assignments and next jobs. Before you take that next assignment or job, make sure it’s an assignment or job where there will be ample opportunities to learn, grow, and develop. Sure, we don’t always have a choice, but if you do, don’t let your company or boss force fit you into roles that just play to your strengths. 7. Find your own mentors. Don’t hold your breath waiting for a mentor to be formally “assigned” to you. Find your own. Look for those that you admire that can give you advice, and ask them. Most people would be flattered. 8. Read books. Yes, books! This is a must for continuous development as a leader, and something I’m seeing less and less. While blogging “top 10 lists” is what I do, I also make sure I’m reading at least a few leadership and management books each year. It requires an attention span of greater than 2 minutes, which is getting harder and harder to maintain. 9. Start with yourself before you coach others. More and more organizations are saying that it’s the manager’s job to develop employees. However, in an organization where every manager is developing others and not developing themselves, you have to wonder if anyone is really developing at all. When you learn to take charge of your own development, you’ll be a role model and have more credibility when you show your employees how to take charge of their own development.